So you’ve got a few days to see the sites in the Big Apple? Don’t waste it at Broadway shows, shopping along 5th Avenue or getting lost in endless rooms of antiquities in the Met. Instead, use this guide to see the work of some of America’s graphic design rock stars in the wild. Manhattan is known for it’s towering, architectural skyline and this tour begins right in the middle of it, in the magnificent neo-gothic lobby of the Woolworth Building. If you make an appointment, you can take a lift up to the 17th floor to visit an Aladdin’s cave of graphic design treasures in the AIGA (American Institute of Graphic Arts) archives. Framed portraits of AIGA presidents harking back to 1914, stand guard over a small, white walled room, which include the watchful eye of the current president, Su Mathews Hale. Filled to the brim with graphic design gems, this treasure trove holds original print runs of every AIGA medalist’s work including breakthrough digital designs by April Greiman. The SVA is where Debbie Millman records her Design Matters podcast. Graphic design is a discipline in rapid evolution but it has it’s roots in the printed object. The Strand bookstore is one of New York’s oldest book stores and you’ll loose hours just in their design section alone. Up stairs in the rickety rare books section, you might find a dog eared editions of Screw, the racy counter culture magazine art directed by Steven Heller in the swinging sixties, way before became an author of over 170 books on the topic of graphic design. A friend of his during this period – singer, song writer Pattie Smith – used to work behind the counter here. It’s also a good place to pick up a copy of Why You: How to Make a Living Doing What You Love the latest publication by Debbie Millman, the host of the world’s most downloaded podcast on design, Design Matters. A few blocks away is the School of Visual Arts (SVA), where Millman records her interviews and runs the MFA in Branding. The SVA has been around since 1947, as a Cartoonists and Illustrator’s School and has had some illustrious alumni including Rebecca Sugar, the creator of the cartoon Steven Universe – which premiered on the Cartoon Network in 2013 as the first ever animated series developed by a woman. The SVA buildings are all over lower Manhattan but you’ll see them marked with oversized flags emblazoned with their floral logo. This was originally designed by George Tscherny, another AIGA medalist and teacher of the first design course there. Steven Universe – which premiered on the Cartoon Network in 2013 as the first ever animated series developed by a woman. As you head up-town towards the Flatiron building, you come to the bursting-at-the-seams offices of Pentagram. Housed in a former bank – their archives are tucked away in the huge vaults in the basement – this design firm now has 21 partners and offices all around the world. Their business model is unique in that all partners share equally in the profits. The teams in the New York office are headed by big names including their first female principal to join the firm in 1991 Paula Scher and Michael Bierut, author of How to Use Graphic Design to Sell Things, Explain Things, Make Things Look Better, Make People Laugh, Make People Cry, and (Every Once in a While) Change the World. The space also used to be a nightclub, which is easy to imagine, given the 5th Avenue address and series of mezzanines that could double for a bar and dance floors. If you want to see some of Scher’s work out in the world, you do not have to go far – Scher’s fingerprint is all over New York. A short step across the road, into the lush oasis of Madison Square Park, is the Shake Shake where her corporate identity of clean, linear illustrations are highly visible on the menus and burger wrappings. Jump in a famous yellow cap – incidentally taxis have become a mobile studio space where Scher has found inspiration to sketch many of her logo concepts – to other must-see destinations that she has branded. Spend time wandering the High Line, an old raised train line that has been repurposed as a park in the Meat Packing District or get in line early for tickets to The Public Theatre who produce Shakespeare plays in Central Park. You’ll see Scher’s work all over these locations in the form of branding systems and promotional campaigns. 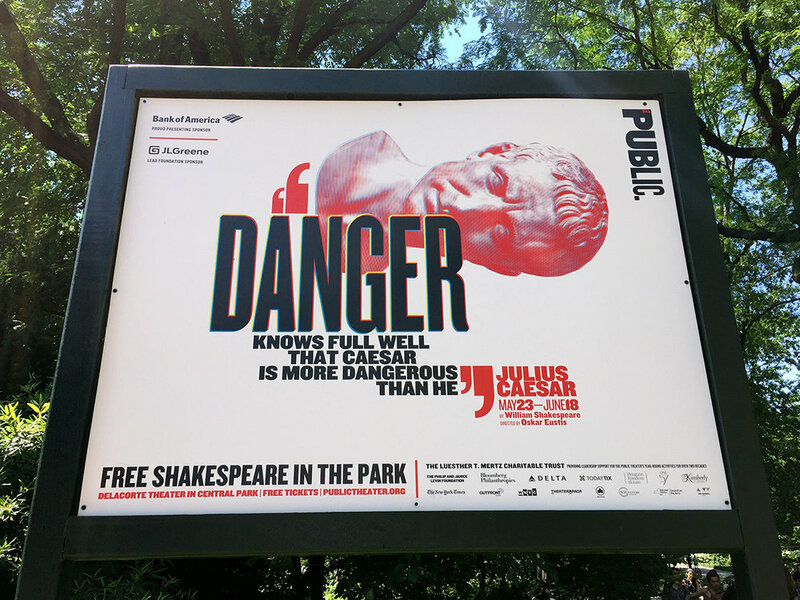 Paula Scher’s campaign for The Public Theatre in Central Park. If the weather’s not so nice, take the taxi to the Museum of Modern Art (MoMA) where they just might have Milton Glaser’s original sketch for the I love New York logo on display. Glaser designed this instantly recognizable black and red heart icon in 1976, pro bono, because he felt his work could make a difference to the then struggling city. It truly is a success story and can be found in the hundreds of souvenir stores selling I love New York t-shirts, mugs, socks and jocks. Grab the chance to get a little bit of NYC graphic design for everyone back home. End the day on Museum Mile, on the edge of Central Park in the swank Upper East Side. Between The Jewish Museum, branded by New York studio Sagmeister & Walsh, and iconic circular Solomon R. Guggenheim Museum, you’ll find the Cooper Hewitt Smithsonian. It’s the perfect place to appreciate every design discipline imaginable, in an interactive and participatory environment. If you happen to be there on a Thursday evening in the Summer, you can enjoy live DJ’s and cocktails on the lawns of the once private mansion. Apparently Australians are the highest proportion of international visitors to the museum. I wonder if the free Cooper Hewitt typeface, which was designed by typographer Chester Jenkins and released in conjunction with their re-brand in 2014, has anything to do with it’s popularity? Using an interactive pen, you can also keep a digital record of the highlights as you wander through. So not only can you leave New York boasting a Milton Glaser original for everyone but you can also claim to be a curator of design in your own right. This article was first published on The Design Writer July 10, 2017.